Below you will find a list of all the Spinpalace Sports bonuses - offered to new players. The right side offers a casino overview (click to scroll through the images). Spin Palace is a name that many Canadians are already familiar with. 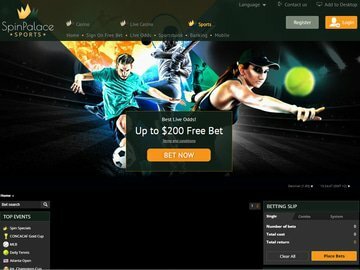 This reputable online casino has just launched this new sports betting site and it looks very promising. They are offering mobile and PC access on all your favourite sports including MBA, NFL, Canadian football, formula 1, golf, horse racing, ice hockey, and more with in play options and live odds. Read our Spinpalace betting review for more information. All real money bettors who sign up for an account with the newly launched Spinpalace sportsbook can claim a 100% first deposit bonus up to $200. This is a new player free bet offer and in order to claim it all you have to do is sign up and fund your account. Spin Palace sports will match your deposit up to $200. The free bets don't stop here either and they offer regular promotions to help Canadian bettors maximize their profits. All account holders receive emails of special offers and deals that they can take advantage of. The latest one? Place a bet from until the end of the World Series (November 1) and Spin Palace sports will reward you with a 10% boost as a Free Bet! That's 10% extra on your total MLB profits, or a 10% cut to your losses. Take advantage of this exciting promotion while it's still live! If betting on the go is your thing, Spin Palace sports makes it easy with their mobile app. You can place your bets anytime, anywhere. The Spinpalace betting app is accessible on all popular smartphone and tablet devices including iOS, Android, and Windows. It brings with it the biggest range of betting markets all available at the touch of your screen. You can deposit and withdrawal and use the live in play portal too. Never miss out on placing your bets again. The mobile version of the website looks and feels just like its desktop counterpart and comes with an intuitive interface. Bettors in Canada want more and it's not just about placing bets on games before they start. This is where in play live betting features. It allows all the betting action to continue right up until the final whistle blow. Spin Palace sports users always have access to the InPlay feature which uses SB Tech software that takes live betting to a whole new level. All their in play live betting games use a finely tuned algorithm that provides accurate odds on any possible score or scenario so there is always a chance to get in that last minute wager as the game plays out. The different types of bets are excellent too including next to score, final score, first half winner, total number of points, etc. You can view them all on the Spinpalace sports website. Spinpalace sportsbook has some of the most competitive odds in the industry as well as the biggest range of betting markets. You can place wagers on everything from golf to tennis and if there is a sport that you are passionate about you'll find the best odds here. Some of the popular betting markets covered include football, cricket, rugby, tennis, NHL, ice hockey, and golf. The site doesn't allow American players but they do offer betting on all the major professional sporting leagues including NFL, MLB, NBA, and NHL. There are niche sports too and you can even place money on eSports. In addition to these punters from Canada will also find election and novelty bets. Spin Palace offers a number of different betting options for each market too. The most popular is fixed odds betting where you know the exact odds and the amount you'll win. Other bet types include pool betting which is popular with horse racing or pari-mutuel bets. Parlay bets are also available and these involve betting on two or more events on one betting slip. Futures betting is another type of bet you can place on events that will take place at a future date. Odds for these bets are usually higher but carry greater risk. For example, you can place bets on the SuperBowl or Premiership League at the start of the season. Over/under bets are also available. Once you decide on your game or match you can display the odds in fractional, decimal, or money line format. Just choose and then fill in your betting slip and watch as the action unfolds. Aggressive odds are available for a range of traditional betting types like win/draw/win, race winner, match winner, goal handicaps, point handicaps, and first scorer. There are also plenty of daily specials for players to look at too. The sportsbook use SB Tech software so customers can expect a smooth and seamless operation. The sportsbook features the same intuitive design and stunning graphics that sports betting fans are used to. When you visit the live odds page or homepage of the website you'll be greeted with everything all in one place. All the on daily sporting highlights are shown on the middle of the page with the inPlay options to your right-hand side along with your betting slip. The left-hand side menu shows a list of all the sports available. All the major banking methods are available including Visa, Mastercard, Skrill, and Neteller and these can be used for deposits and withdrawals. The site also holds a license by the Malta Gaming Authority and all online banking transaction are routed through advanced P128-bit SSL encryption software to ensure that all player data is kept safe and secure. Customer support is available 24 hours a day, 7 days a week via live chat, phone, and email. There is also a FAQs section on the website. The customer support team is friendly and professional and available to answer any question you might have. Support is available in multiple languages too including French and English. Although the sportsbook has just opened, the site is one that is already highly trusted and recommended for Canadian players. Their online casino offering has been in operation since 2001 and the owners the Palace Group have an excellent reputation. The sportsbook offers all new customers a 100% first deposit match up to $200 and there are over 70 different sports to bet on. The site is easy to navigate and is also mobile responsive. There are mobile apps available for iOS, Android, and Windows operating systems so you can enjoy betting on the go. The odds are very competitive and the inPlay portal is excellent too with plenty of markets and options to choose from. Overall, our Spinpalace betting review is very positive and we look forward to seeing how well they do in the Canadian market. Reward yourself with a 100% match bonus up to $100 when you register with Spin Palace Sports. This world-class sports betting brand also boasts with mobile betting apps, live betting, and plenty of sporting events. Visit our sportsbook review section for additional info. Searching for the ultimate sports betting brand in Canada? Register with Spin Palace Sports and claim your exclusive 100% bonus up to $200 to enjoy on a phenomenal variety of sports, including basketball, baseball, football, ice hockey, formula 1, and more. Visit our reviews section for more information. Canadian punters can sign up with one of the best sports betting brands in the world when registering with Spin Palace. Treat yourself to a 100% bonus up to $100 and place an assortment of bets on the go. You can also look forward to fantastic promotions and in-play betting options on your mobile. As one of the best sports betting brands for Canadian bettors, Spin Palace Sports offers a memorable 100% match bonus up to $100 along with plenty of international sports to bet on. Visit our detailed reviewds section for more information on this incredible bookmaker. Spin Palace is a top-rated sports betting site in Canada and for good reason. The brand offers a terrific 100% match bonus up to $100 along with a remarkable selection of sporting events to bet on. Visit our sports betting section for more information. Spin Palace Sports is rated one of the best sports betting brands for players in Canada. Claim an unforgettable 100% welcome bonus up to $100 and wager on an assortment of sports, such as cricket, tennis, basketball, and formula 1. Find out more by reading our reviews. Spin Palace is quickly climbing the ranks as the best sportsbetting site for Canadian players. Enjoy a 100% welcome bonus up to $100 and bet on sports like football, basketball, tennis, and even cricket. Read through our all-inclusive reviews to find out more. Spin Palace continues to be one of the preferred sportsbooks in Canada. Bet on the NFL, NBA, NHL, MLB, and loads more with your 100% match up to $100 when you register a new account. Take advantage of the Spin Parlay Insurance Special at Spin Palace and bet on a four-fold accumulator using the Moneyline and Match Winner markets on any MBL, NCAA, NFL, NHL, NCAAB, or NBA matches. If you are let down by 1 selection, Spin Palace will refund you with a Free Bet equal to your initial stake up to $50. Never miss a deal while betting at Spin Palace Sports. Simply subscribe to the Daily Deal promotion and receive notifications via email or SMS. Each notification will either include game releases, exclusive rewards, latest promotions, or other products tailor-made just for you,. Established in 2017, Spin Palace is quickly becoming a popular choice among Canadian bettors thanks to a large selection of sports with some of the best odds in the industry. Spin Palace also offers live in-play betting with outstanding promotions and bonuses as well as a wide range of payment methods to easy transact on both desktop and mobile devices. 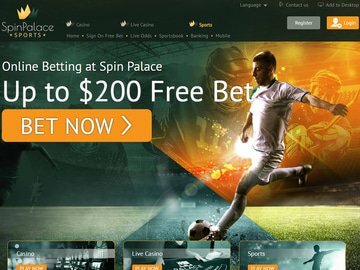 As one of the latest online sports betting sites, Spin Palace offers around the clock betting on both desktop and mobile devices on a massive range of sporting events. The site also provides free bet promotions, competitive odds, live in-play betting, outstanding promotions, and a well-established website that is extremely easy to use. Established in 2017, Spin Palace is the latest online sportsbook offering around the clock betting from anywhere in the world on mobile devices, provides high odds on all sports, and the odds are updated in real time. The site further impresses with free bet promotions and live in-play options.